If you are a writer who identifies with any group that is underrepresented in traditional publishing and you have some financial need, please check out the All Voices Fellowship Application, which awards one free spot on this retreat to a writer who meets those qualifications. Come write in the cold and (possible) snow! 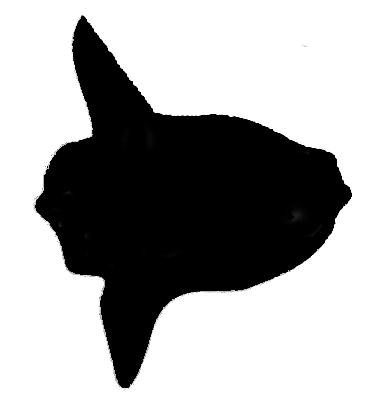 For the first time, Splendid Mola is adding in a Winter retreat. 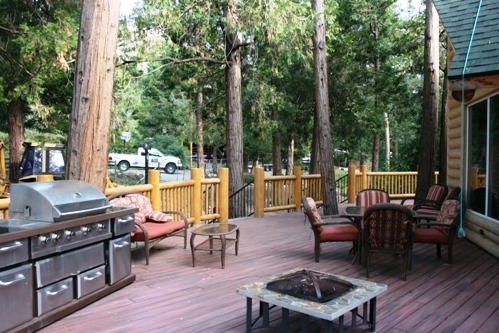 Idyllwild is one of the most popular non-ski winter tourist destinations because it is simply stunning in the snow. 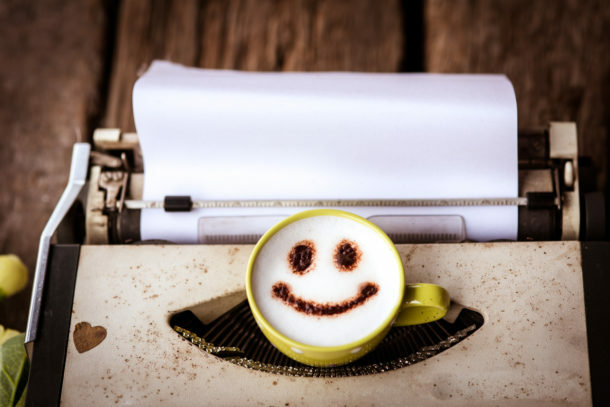 Imagine writing at the fireplace, a cup of hot chocolate (or a hot toddy!) in hand. Or sitting in the hot tub under the stars with the chill of winter all around. To make sure no one has to walk far in the cold and possible snow (unless you want to! 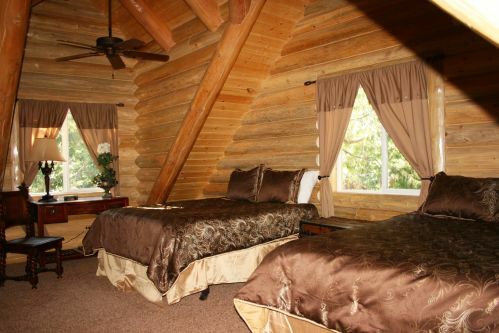 ), the retreat is consolidated in two locations, across the street from each other: the Luxury Log Cabin (which sleeps nine) and Fern Valley Inn, single cottages right across the street. 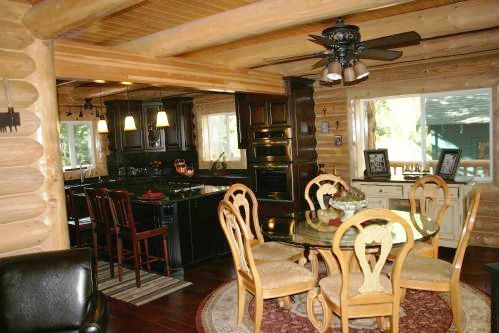 Yoga will be in the living room of the Luxury Log Cabin. 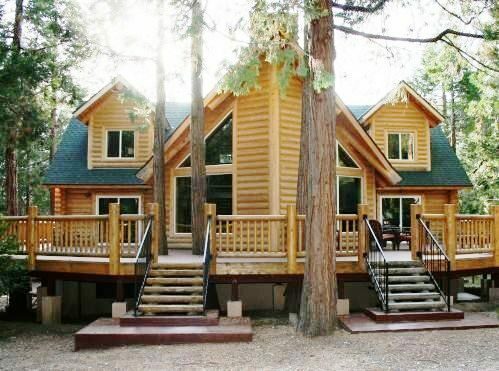 This retreat will be slightly smaller than usual, with a cap of 18 people. The roads leading up to Idyllwild are always plowed in the snow, and both locations are on flatlands with easy-to-access driveways—but be aware there are chains may be required to get up the mountain! I’ve been told by locals that chains are needed only 5-10 times a year, but do keep in mind that this is a possibility. Scroll down for room options and registration directions. If you are looking for a description of the retreat, it’s here. This cabin is sold out. Scroll down for more options! 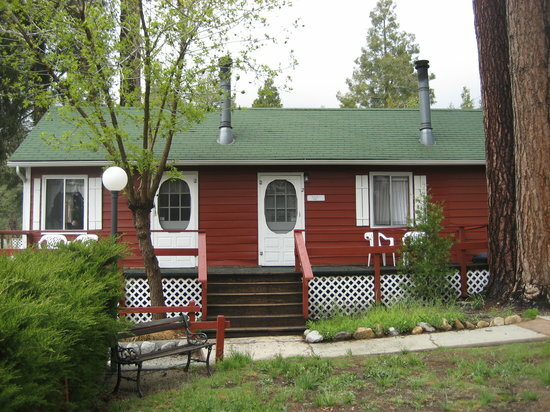 The hub for our writers retreat, this is a simply beautiful and large log cabin in a lovely area near hiking trails and the town. 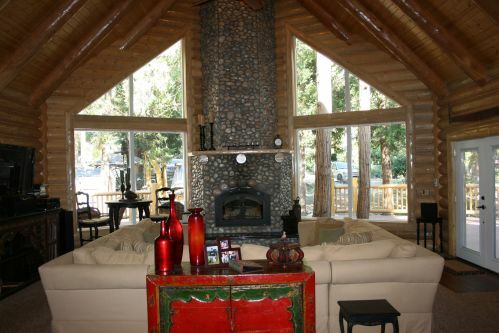 It’s all wood logs, which makes is incredibly warm and quiet inside, and the floor plan is remarkably open, spacious, and filled with high ceilings and giant picture windows. This is where we will meet for breakfast, dinner, meditation, and yoga (lunches are delivered to you). 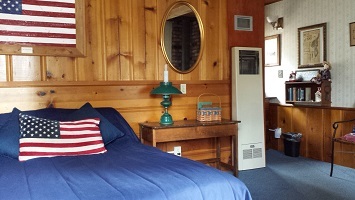 The most gorgeous parts of this cabin are the communal areas. 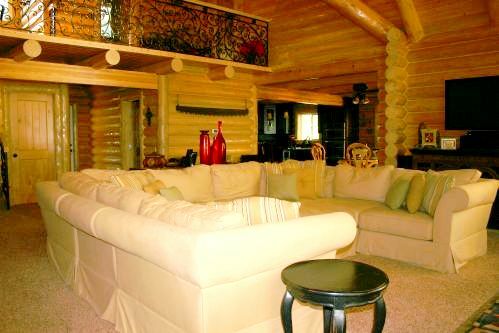 The living room is spectacular, with huge couches and a stone fireplace; there is a game room and gym downstairs, and the deck…well, for those of you who like to be outside, it is huge and lovely, complete with a hot tub that can hold 7-10 people, so bring your bathing suit! There are dining areas both inside and out, as well as swings and a hammock in the surrounding woody area. 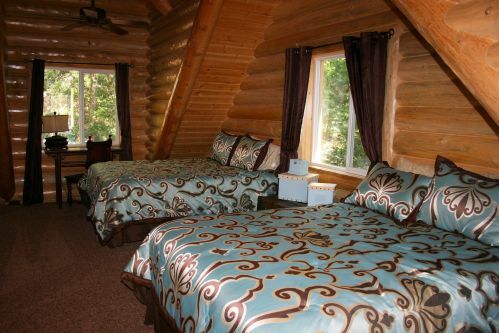 Luxury Log Cabin is open to all genders. If you reserve a shared room, please let me know which gender(s) you want to room with and I will mark that room as such. I don’t have a photo of this room as, up until recently, it’s been held for the owner only. But now it’s open up to us as well! This gorgeous room is right off the main living/gathering space pictured above, and has a huge private bathroom as well as a private entrance to the deck that offers bright natural light. Because this room is right off the main area, where people gather for breakfast and yoga and may hang out and talk after dinner, this room is best for someone who doesn’t sleep past 8 am or go to bed before 9:30 pm. And – you will hear music from the yoga class if you’re in your room! These downstairs rooms are dark, quiet, and cozy. 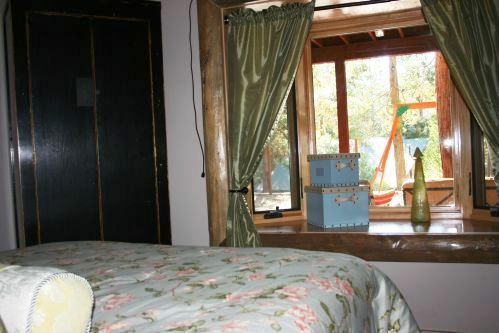 There is a window, but it looks out to under the house rather than to a view. There is a game room in the middle of the downstairs, with foozball and ping pong and exercise equipment as well as couches for additional writing space. Downstairs is quieter and cooler than upstairs, as well as more private. 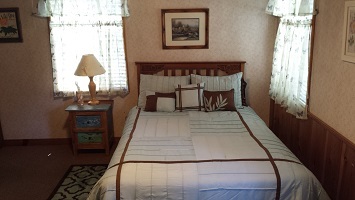 *If you would like to share this room with a friend, contact me for pricing. 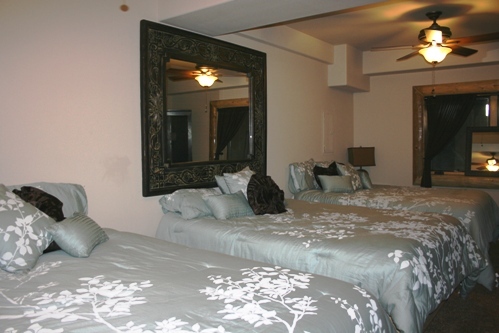 *If there are three of you who want to share this room, contact me for pricing. 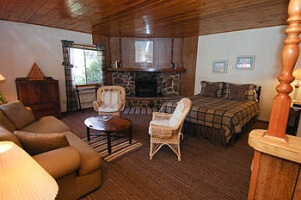 Fern Valley Inn is a quaint and rustic inn located directly across the street from the Luxury Log Cabin. 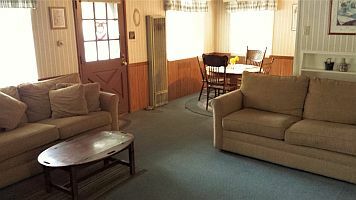 It’s a combination of stand-alone cottages and joined rooms—the photo here shows the four rooms that are connected. 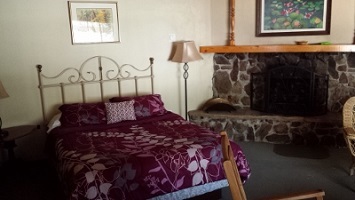 Fern Valley Inn rooms are open for any gender and are perfect for anyone who wants their own space but likes to be a few close steps away from the main hub. This sweet, smallish room is one in a block of four that shares the same building and a porch. This sweet, smallish room is one in a block of four that shares the same building and a porch. This room includes a private patio with a table. 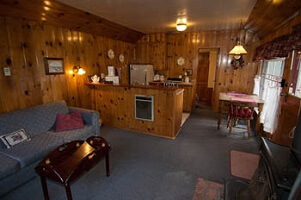 As its name implies, Hideaway is a stand-alone cabin tucked away in the side of the property…and there’s a DESK! This sweet, smallish room is one in a block of four that shares the same building and a porch…and, this one also has a DESK (yippee!). 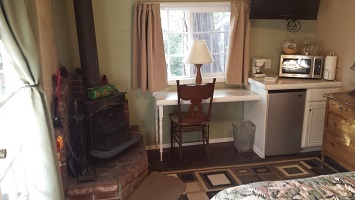 This is a two-room cottage with a full kitchen (for midnight cooking? 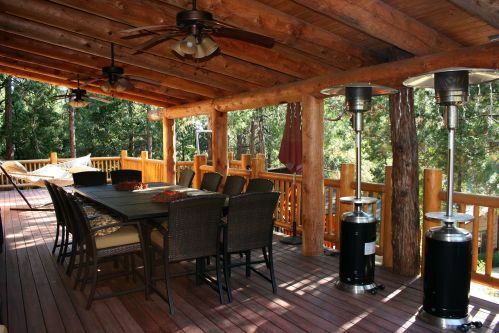 ), a private attached deck, and a small writing table by a window. 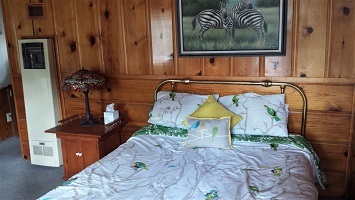 Havana shares a wall with Heidelberg Zimmer – it’s a sweet single room, and also one of the few rooms in Idyllwild with air conditioning, if you feel so inclined! 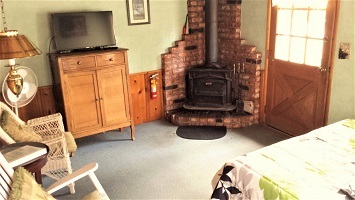 The largest cottage at the Inn, this has two rooms with two sofas in the living room, a full kitchen, a private attached deck, and a dining room table for writing! Heidelberg Zimmer is the “sister room” to Havana Bungalow, as they are in the same building and share a wall. 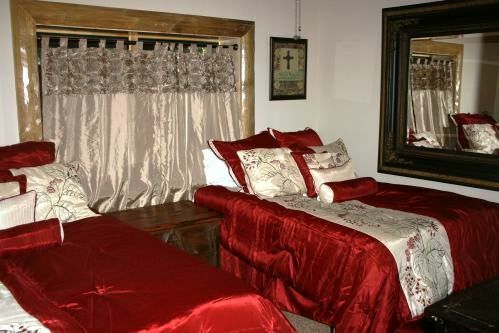 It has the same amenities, including a sofa bed. If you want to share with a friend that can be arranged. Pay in full or with a payment plan option, where a $250 deposit holds your spot. Payment plan options are an additional $25 to cover associated admin costs. 1. Select your room and occupancy choice, below. 2. Click on the link for your payment option (deposit or pay in full). 3. Proceed as directed by Paypal. Please note that 3% will be added to the total to cover Paypal’s service fee. 4. IF YOU ARE PAYING A DEPOSIT ONLY, email me your room choice so I can mark it as reserved! 5. Once payment is received, I will send you a registration form to gather your meal choices, etc. 2. Email me and let me know which room you want and that you want to pay by check, money order, or quick pay. 3. I will email you the payment instructions. 4. Once payment is received, I will send you a registration form to gather your meal choices, etc.